Can a Felon Become a Mechanical Engineer? Felons may think nobody will hire them after serving their sentence, but there are resources available. Many employers have discovered that felons make good employees. Some felons may have an interest in becoming an engineer. 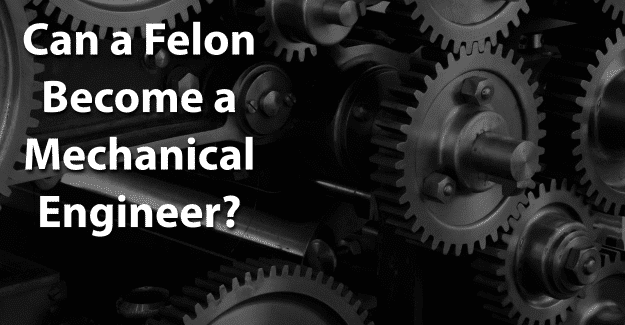 This blog post will address the issue of whether or not a felon can become a mechanical engineer. What Education/Training Does a Mechanical Engineer Need? How Much Does a Mechanical Engineer Earn? An engineer applies the principles of science and mathematics to develop an efficient solution to a technical problem. Many engineers develop new products while others improve upon an existing one. An engineer tests, produces, and maintains systems or procedures using a computer to produce and analyze designs. A mechanical engineer designs, develops, builds, and tests mechanical and sensor devices. They design mechanized devices with computer-aided plans and diagnose and fix faulty systems. Most mechanical engineering programs take four to five years to complete. For some specialties in the mechanical field, a Master’s degree may be necessary, although an entry-level position does not have this requirement. All states require licensure for a mechanical engineer performing services directly for the public. After completing an accredited program, an individual takes an exam called the Fundamentals of Engineering Exam. This allows him or her to be called an engineer in training (ET). Typically, after four years of related work, an entry level engineer is eligible to take the licensing exam, the Principles and Practice of Engineering Exam. While a license isn’t required to be an engineer, since 1907 the Professional Engineering designation has been used to protect the health, safety, and welfare of the public. A Professional Engineer (PE) license is required to sign and finalize engineering plans and to offer services to the public. A license is not required for an entry-level position as a mechanical engineer. A professional engineering license may be required for many more advanced engineering positions. In order to obtain a mechanical engineering degree, one must obtain a bachelor’s degree for an entry-level position. Many colleges offer a degree, either an associate or a bachelor’s, in mechanical engineering technology. This allows an individual to work on practical design and production work even though he or she will not be eligible to be licensed as a Professional Engineer. The Accreditation Board for Engineering and Technology (ABET) approves college and university mechanical engineering programs. Graduation from one of these programs is typically required to be licensed. The U.S. Bureau of Labor Statistics indicates that there are approximately 288,800 practicing mechanical engineers in the United States. This occupation is expected to show a 9% growth by 2024. The median salary of a mechanical engineer in 2016 was $85,880 annually. This is the salary at which half of mechanical engineers earned more and half earned less. Experience will make a difference in how much a mechanical engineer earns annually. The area of the country in which a mechanical engineer works also makes a difference. Those in Texas, Louisiana, Alaska, and Colorado typically earn more than a mechanical engineer that works elsewhere. A felon can pursue any degree they want. While as many as 60% of colleges consider criminal history in their admissions process, there’s no standard policy regarding a background check. Any felon wanting to get a degree can find a college that will accept them. The challenge is in obtaining a license as a mechanical engineer and a job after graduating. It’s important to be honest when filling out an application for licensing as a Professional Engineer. If a felony isn’t disclosed but found on a background check, this constitutes fraud and is a punishable crime. For anyone considering not being honest about their felony, keep in mind it’s a crime to falsify an application, which could result in being sent back to prison. Having their felony expunged can give them the chance needed to begin with a clean record and succeed in becoming a mechanical engineer. Expunging a criminal record allows anyone to honestly state on an application that he or she has not been convicted of a crime. It’s a big challenge, but it might be worth it for a felon wanting to become a mechanical engineer. Giving him or herself the best chance for success by having his or her record expunged and also documenting any programs, education, or training completed could be critical. Having support from family, friends, counselors, or previous employers can make a huge difference. A felon doesn’t have to be defined by his or her crime. We are defined by how we recover from our mistakes, not by the mistakes themselves. He or she can begin again and live an honest life no matter how difficult it might seem. What do you think about this blog post? Have you or someone you know been in the situation of trying to become a mechanical engineer with a felony? What was that like for him or her, and how did he or she achieve success? Please tell us in the comments below. The best job for a Mechanical Engineer is in Design Engineer. It teaches you that in life, for your growth and success, the contribution by the others are an important factor. Thanks for sharing.